The Globalists Depopulation Agenda Is Real: This Is What They And The 'Big Pharma Mafia' Don't Want Us To Know! - In Jaw Dropping Study, Raw Garlic Killed Almost ALL Cancers! With Americans now being bombarded by cancer-causing carcinogens in our food, water and air every day, with Monsanto's roundup poison being found in food worldwide, particularly breakfast foods aimed to children, while wifi radiation from cell phone towers leads to more cancers and more deaths, we must take a look within this story at some stunning and highly censored information via a study published 10 years ago that big pharma has done their very best to hide. As we had reported just days ago on April 3rd in our story titled "A Public Health Disaster Is Being Unleashed Upon America That Doctors Warn Is Causing Heart Problems, Cancers & Brain Tumors And We're Only Now Seeing The 'Tip Of The Iceberg'", a group of 250 doctors and scientists from more than 40 different countries had recently signed a petition to the World Health Organization and the United Nations warning them of the well-documented dangers of radiation from WiFi, cell phones and bluetooth, urging the 5G rollout be more carefully studied. So while doing research for this follow up ANP story, I ran across an absolutely jaw-dropping study that was done all the way back in 2008 and published in 2009 which we've embedded in full at the bottom of this story, a study which 'Chris Beats Cancer' reports is highly censored by 'big pharma' and 'big government' because it contains information which doctors can’t even discuss with their patients for fear they'll risk losing their medical licenses. But as Chris points out in his story, being free Americans, we can discuss what 'big pharma' and 'big government' (hell-bent upon population reduction) don't want us to know and as we'll see within this stunning study, a 'cure' for many kinds of cancer has already seemingly been found. First, from 'Chris Beats Cancer' with much more below. 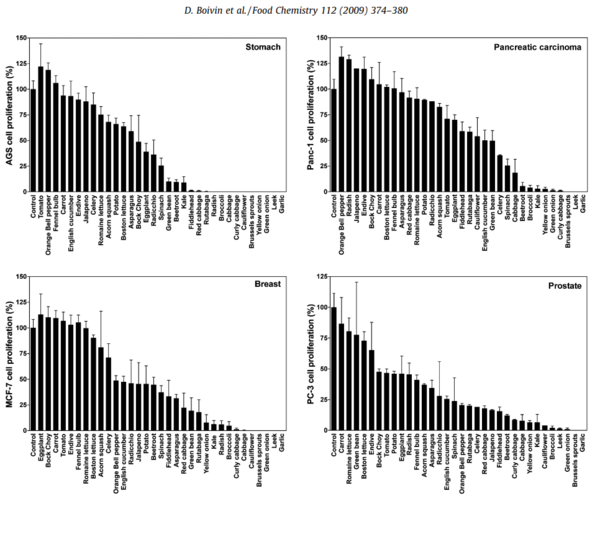 Researchers studied the inhibitory (cancer-stopping) effects of 34 vegetable extracts on 8 different tumor cell lines. They basically just ran vegetables through a juicer and then dripped the extracted juice on different cancer cells to see what would happen. The #1 most powerful anti-cancer food was Garlic. Garlic stopped cancer growth COMPLETELY against these tumor cell lines: Breast cancer. Brain cancer. Lung cancer. Pancreatic cancer. Prostate cancer. Childhood brain cancer and stomach cancer. Rounding out the top 10 were: Leeks, Yellow and Green Onions, Broccoli, Brussels Sprouts, Cauliflower, Kale, Red and Curly Cabbage, Spinach and Beet Root. As his story pointed out, there are literally thousands of published peer-reviewed studies demonstrating that the 100,000+ phytonutrients in plants have the ability to prevent and reverse cancer. But because the pharmaceutical industry can’t figure out how to extract these compounds, synthesize them, and patent them for profit, they are ignored. And as Chris also points out, while it’s important to keep in mind that this was only a laboratory study showing what various vegetable extracts did to cancer cells when applied directly upon them, and the study did not take into account the vitamins, minerals and phytonutrients that indirectly support your body’s ability to repair, regenerate, detoxify and heal, nor did it take into account an individual's daily routines or lifestyles, "having said all that, it makes sense to focus on eating tons of the veggies that were actually killing cancer in the lab." 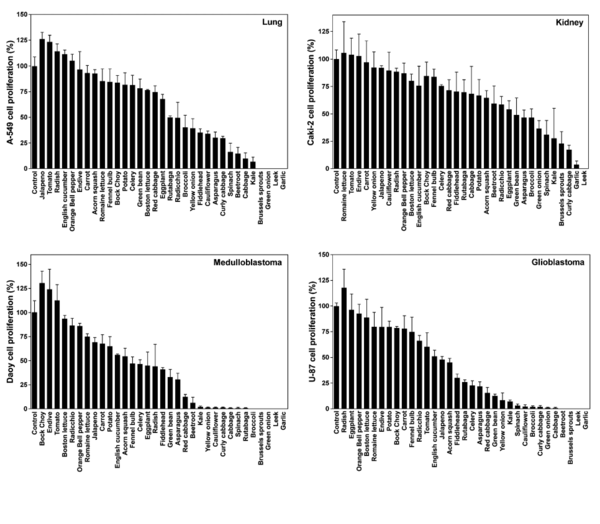 Also this study confirms why what I did in 2004 worked. I ate copious amounts of these cancer-fighting vegetables every day in my Giant Cancer-Fighting Salad, specifically spinach, kale, broccoli, cauliflower, onions, red cabbage, and garlic powder. I had no idea about leeks or else they would have been in there too. Garlic is an anti-cancer vegetable. And according to Dr. Richard Schulze’s recommendation, I ate several cloves of garlic per day. If garlic kills cancer, then I wanted to saturate my body with garlic. So I would just crush up the cloves and swallow them with a mouthful of water. I also took Kyolic Garlic Extract. And yes, I reeked. But I lived to tell the tale! Just look at the charts above and below which were taken from the study we've embedded at the bottom of this story. While many vegetables tested saw an increase in the growth of the cancer cells tested, garlic killed every cancer cell tested, almost completely wiping out all of them, and was the #1 vegetable against all cancer cells tested except for kidney cancer, in which 'leeks' took #1. With cancer one of the biggest killers in America, why do we never hear about these very real 'miracles from God' from the mainstream media? Besides 'big pharma' likely to lose 10's of millions of dollars as people go 'all natural' to cure themselves of cancer without big pharma's poisons, an end to cancer would immediately put a huge dent in the globalists depopulation agenda. And as we've reported previously on ANP, garlic is not only a cancer killer but as Sarah Landers had reported within this June of 2016 story over at Natural News, garlic's healing properties are so intense that it is 100 times more effective than antibiotic treatments. Susan Duclos and I have both gotten rid of tooth infections by using this form of raw garlic and as we've also previously reported, with growing antibiotic resistance in bacteria, in a SHTF scenario, garlic is absolutely one of the best go-to's. Garlic has been used for thousands of years all over the world, and modern science is now backing up its medicinal properties. A recent study by researchers at Washington University has found that garlic can be up to 100 times as effective at treating bacterial infections as most mainstream antibiotics, as reported by Natural News. Garlic is not just antibacterial, but it is also packed full of antioxidants that work to improve your overall health. It is high in sulfur, which can help to detoxify your system and remove unwanted toxins, as well as removing other substances that make your body more vulnerable to infection. According to Natural Health 365, aged garlic extract has shown significant promise in its ability to reverse the deadly buildup of plaque in arteries. A study conducted at the independent biomedical research facility LA BioMed, Torrance, California, has proven that adding aged garlic extract supplement to diets reduces the amount of soft plaque – known as low-attenuation plaque – that has built up in the arteries of patients. 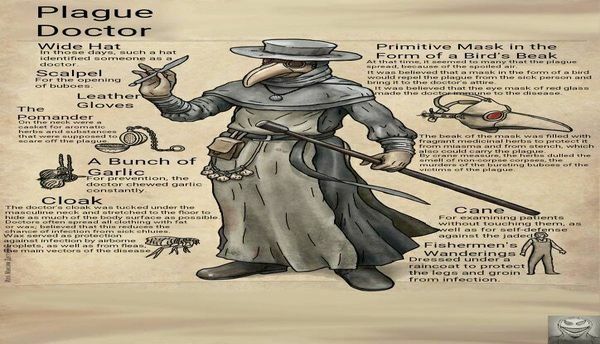 And as we've also previously reported on ANP, during deadly plague outbreaks in the Middle Ages, plague doctors such as the one seen above actually wore a bunch of garlic around their body as part of their weaponry against the black death that killed nearly everybody it visited, with plague doctors chewing garlic constantly to ward off what left most others dead. Garlic is a super strong natural antibiotic that kills most infections if used properly. In fact, prior to the invention of antibiotics garlic was one of the primary ways people killed bacterial infections. In all vampire belief systems and lore, except for Russian (Vodka anyone? ), vampires are created by an infection of the blood and spend eternity draining the blood of others to squash there endless thirst for the red stuff. It could be that because garlic has such strong curative properties the myths around vampire’s fears of garlic are founded in their fear of dying by the cure. The use of garlic is known all over the world, not only as a tasty accent to foods, but also as a charm against evil spirits. Even in places such as China or Malaysia, people smear the forehead of their children to protect them from Vampires, and in the West Indies too, garlic is used as a means of protection against the evil practices and magical spells of Witches and Sorcerers. Garlic was used for more than just fighting vampires in the past, it was also used for keeping away werewolves, ward off various evil spirits, and to protect against demonic possession. People believed that by hanging some garlic bulbs around the neck that it would protect against nearly every form of evil. Garlic (Allium Sativum) has been used as a charm against evil and dates back the ancient Egyptians. They believed in a Vampire-like ghost that killed sleeping children by sucking up their breath. The protection that was used against the attacks of this murderous monster was a wreath of garlic. In Romania, garlic is also a weapon of importance in the everlasting battle against Vampires. Romanians used to make certain that they ate garlic every day for their protection. They also smeared garlic on the windows and the doors of their houses, on the gates to their farmyards, and even on the horns of their cattle. They believed that these Vampires had a great fear of garlic. Eating garlic regularly is not only good for us; it has been linked to reducing or even helping to prevent four of the major causes of death worldwide, including heart disease, stroke, cancer and infections. The National Cancer Institute does not recommend any dietary supplement for cancer prevention, but it does recognize garlic as one of several vegetables with potential anticancer properties. As you are about to see, raw garlic benefits are plentiful. It can used as an effective form of plant-based medicine in many ways, including the following. According to the Centers for Disease Control and Prevention, heart disease is the No. 1 killer in the United States, followed by cancer. Garlic has been widely recognized as both a preventative agent and treatment of many cardiovascular and metabolic diseases, including atherosclerosis, hyperlipidemia, thrombosis, hypertension and diabetes. A scientific review of experimental and clinical studies of garlic benefits found that, overall, garlic consumption has significant cardioprotective effects in both animal and human studies. Probably the most amazing characteristic of garlic is that it’s been shown to help reverse early heart disease by removing plaque buildup in arteries. A 2016 randomized, double-blind study published in the Journal of Nutrition involved 55 patients, aged 40 to 75 years, who had been diagnosed with metabolic syndrome. The results of the study showed that aged garlic extract effectively reduced plaque in coronary arteries (the arteries supplying blood to the heart) for patients with metabolic syndrome. Allium vegetables, especially garlic and onions, and their bioactive sulfur compounds are believed to have effects at each stage of cancer formation and affect many biological processes that modify cancer risk. Much more on the health, medicinal and survival benefits of raw garlic can be found here. So ANP is accepting reader donations.